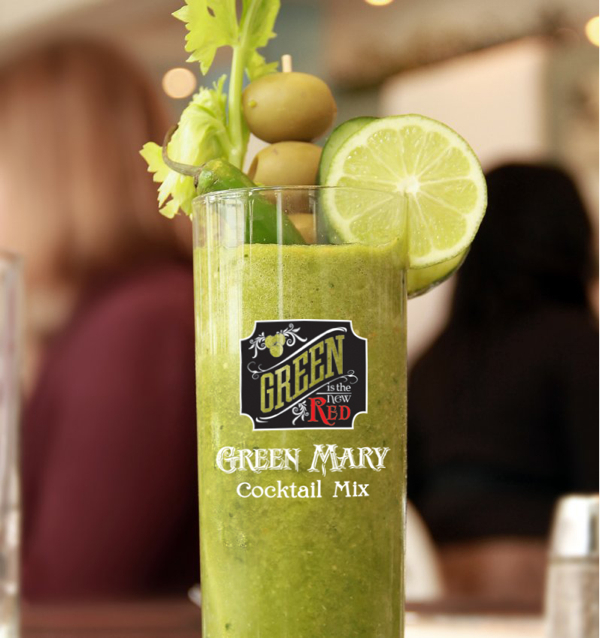 As I write this, it’s St. Patrick’s Day weekend in the US, where everyone is Irish and everything is green, and our Sunday Bloody Mary post this week features a bright green mixer from Frankie V’s Kitchen of Dallas, Texas. 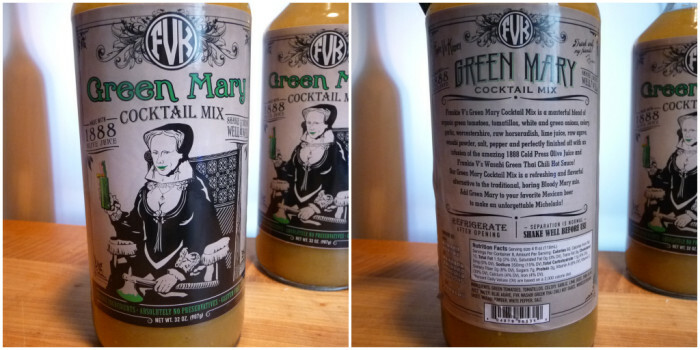 This uniquely different mixer includes green tomatoes, tomatillos, premium olive juice and Frankie V’s own Wasabi Green Thai Chile Hot Sauce. Yea, this is a horse of a different color! 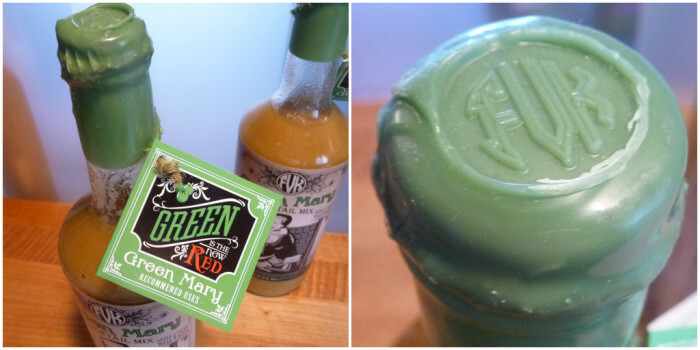 Ingredients: green tomatoes, tomatillos, celery, garlic, lime juice, 1888 Olive Juice, water, blue agave, FVK Wasabi Green Thai Chile Hot Sauce, worcestershire sauce, wasabi powder, white pepper, salt. Texture & Appearance: Medium thin in consistency and bright green in color. There are lots of bits in here – tiny tomatillo seeds, little bits of garlic and green tomato – very satisfying with a good amount of mouth-feel. Complex. Taste Straight Up: This is a mixer unlike any I’ve ever had. 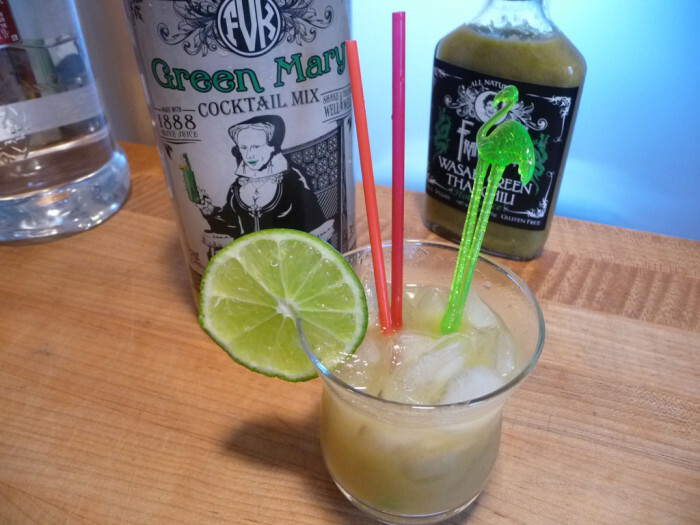 Straight up, Green Mary is very refreshing, tart and more than just a bit spicy – the unique green tomatoes and tomatillos bring a fresh acidic taste. 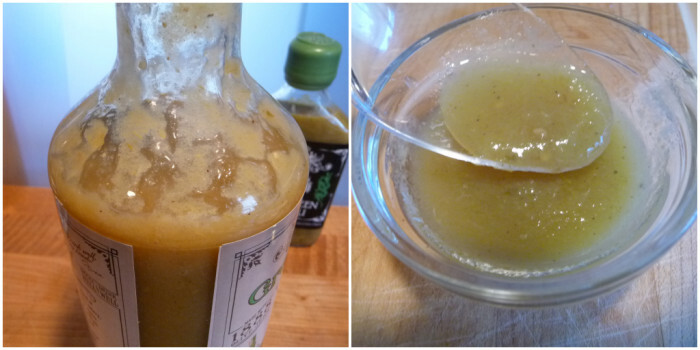 Briny, salty olive juice hits you next, with the mild heat of wasabi bringing up the rear. 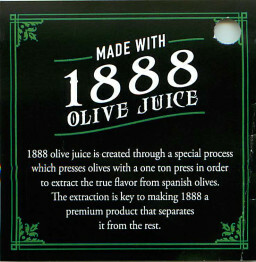 The inclusion of 1888 Olive Juice is a genius move on their part – designed for “dirty martinis”, 1888 Olive Juice (another Texas product) is a dirty martini mixer that adds a salty, briny flavor to this Green Mary drink. Unique and savory. Heat Level: – 1.5/5 Stars. Mild and tingly – the wasabi is there, and yes, Frankie V’s Wasabi Green Thai Chile Hot Sauce is a player here too, but it’s not a blow your head off heat. Mild in a good way. Label/Graphics: – 5/5 on design, label, fonts and overall impression. Bonus points for the green wax covered top that sports the “Frankie V’s Kitchen FVK” impression. Also, there’s the hanging tag and twine that are incorporated into the wax topping. Like all of Frankie V’s products, the art department deserves kudos and accolades for another stellar design. Classy. This very unique “bloody mary” mixer has to be one of the most unusual mixers I’ve ever come across. It tastes fantastic all on it’s own, as a tomato cocktail, albeit a “green” one. It would make a great Michelada beverage with your favorite Cerveza. Overall Rating: – 3/5 Stars for uniqueness. It just may be an acquired taste, but the more I drank it, the more I liked it. This is certainly one of the most unusual products we’ve reviewed in a while – but delicious nonetheless. Visit FrankieVsKitchen.com and check out all of the salsas, sauces and of course The Green Mary Cocktail Mix. You can sample all of the great products from Frankie V’s Kitchen and meet Frankie V at the NYC Hot Sauce Expo, March 29 – 30, 2014. 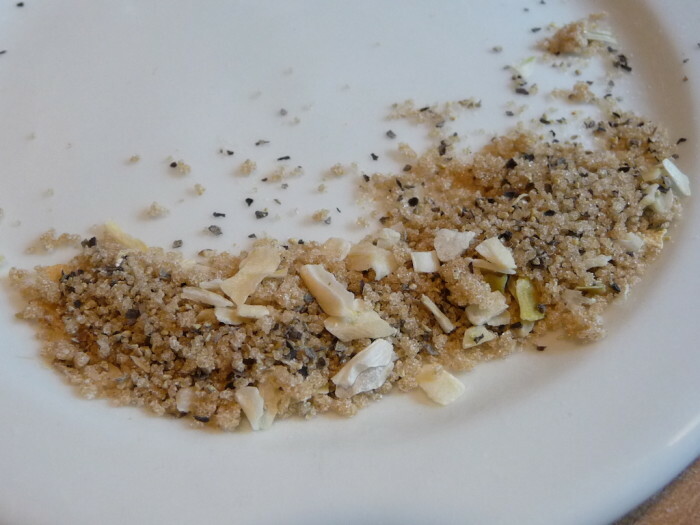 We reviewed Frankie V’s Salsas here. 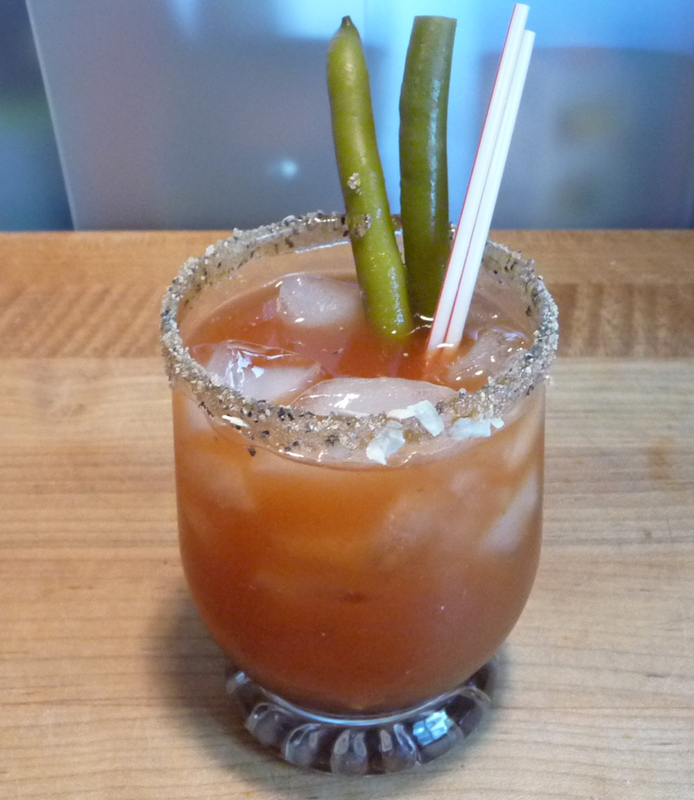 Continuing our Sunday Bloody Mary series, we are featuring a unique BBQ Bloody Mary Recipe using Chili Dan’s All Purpose Start to Finish Sauce, his custom rim topper recipe, V8 Vegetable Juice, and garnished with some spicy pickled green beans from Blaze’s. This is a BBQ Bloody Mary Recipe that you can craft to be your own. 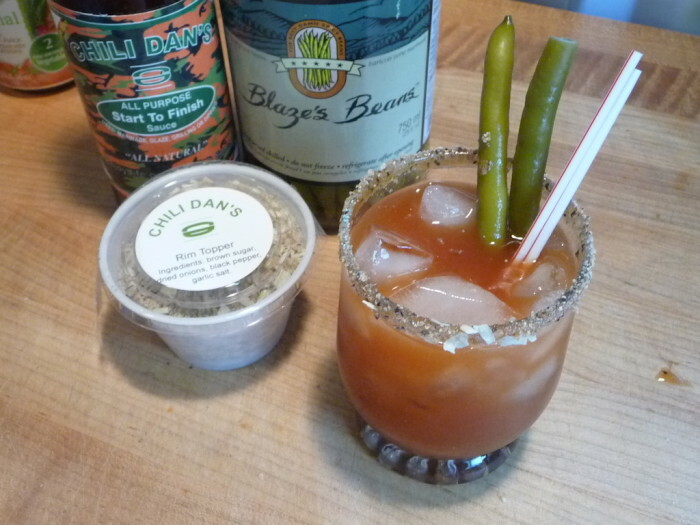 One of our Top Favorite Products in 2013, Chili Dan’s All Purpose Start to Finish Sauce is the basis for this unique BBQ flavored Bloody Mary recipe. 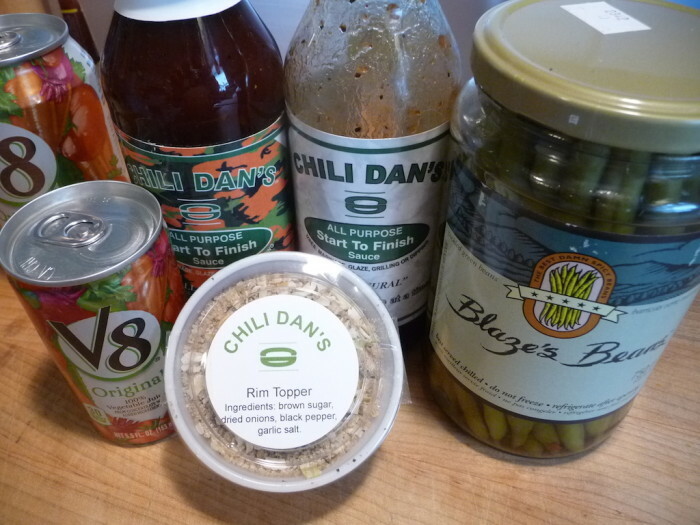 Sweet and savory, we reviewed Chili Dan’s here. Now, “Chili Dan” Miller is going to have my head on a platter for suggesting that this is a BBQ Bloody Mary Recipe. Chili Dan’s All Purpose Sauce is anything BUT a BBQ sauce… but we have to categorize this somehow… and so BBQ it is. The beauty of this recipe, like all good recipes, is that you can make it your own! While we would love for you to get your hands on a couple of bottles of Chili Dan’s Sauce… you can substitute any other favorite BBQ sauce (sweeter is best here) and any spice blend you like for the glass rim. And while Blaze’s Pickled Green Beans is celebrating 20 years up in Vancouver, Canada… again, garnishes are up to you. BTW, Blaze’s Green Beans are easily ordered for shipping to the US on their website. Pas de problème. You’re going to pour a little bit of Chili Dan’s (or your favorite BBQ sauce) onto a dish to wet the rim of your glass. 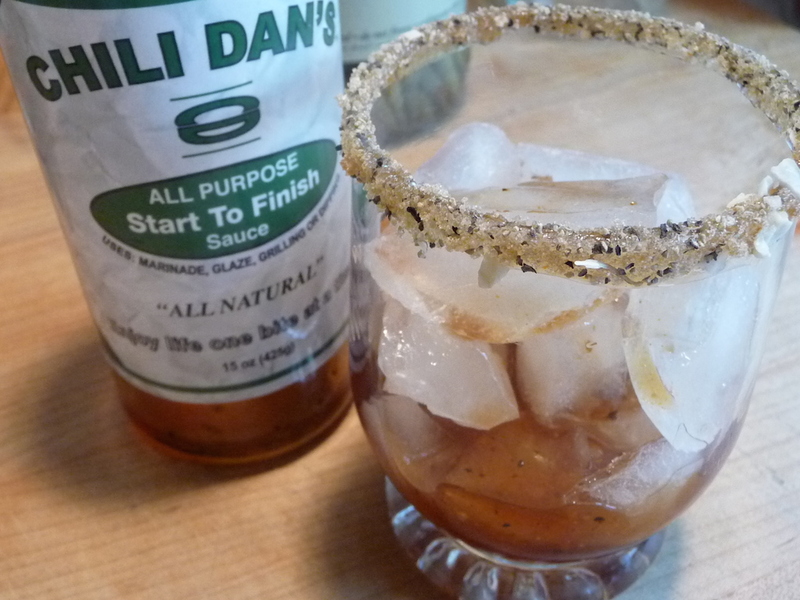 You’re going to dredge the wet rimmed glass in Chili Dan’s Rim Topper seasoning (or your favorite seasonings). Fill that glass with ice, and add 1 or 2 or 3 tablespoons of Chili Dan’s All Purpose Start to Finish Sauce (or your favorite BBQ sauce). Add the Blaze’s Beans and/or any garnishes you like. Chili Dan calls for a “floater” of 1/2 ounce juice (brine) from the pickled beans. I passed on that step. Final Thoughts: – Refreshing. Probably the most enjoyable and refreshing Bloody Mary I’ve had in a long time. The overall sweet taste was a nice departure from the typical hot, spicy, horseradish-laden Bloody Mary mixers. NOT THAT THERE’S ANYTHING WRONG WITH THAT! To wrap things up, seriously consider working with this recipe, hopefully with some Chili Dan’s, and make it your own. Get creative and enjoy! Fast forward to 4:18 for the Bloody Mary. 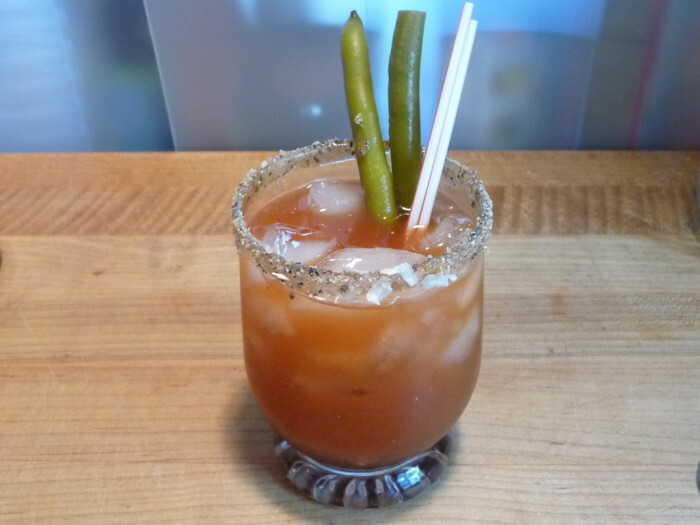 Do you have a favorite BBQ sauce based Bloody Mary Recipe? Tell us about it in the Comments below. We’d all like to learn from each other!